We undertake fabrication and fitting of stainless steel and glass balustrades to customer specification using brushed stainless steel tube and toughened 10mm safety glass. Clients include architects, builders, interoir designers, shop fitters and the general public. 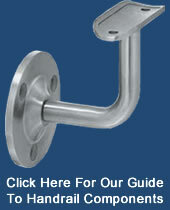 click here for our handrail component guide. Case Studies: We carry out work for small to medium sized refurbishments and new builds including offices, restaurants, wine bars and retail outlets. Below are details of a number of recent projects we have carried out. If you have a requirement for stainless steel and glass balustrading or any other type of balustrading and metalwork feel free to contact us.